I know that the future of full maternity services at the Horton General Hospital, used by many South Northants women, is of concern to lots of residents. It is so important that we get this right, for all mums-to-be, and safeguard the right level of maternity services at the Horton into the future, and I am really grateful for the excellent leadership my colleague and constituency neighbour Victoria Prentis MP has taken on this issue. My team and I are working to support her in her determined efforts to restore obstetrics at the Horton, as the Horton is situated within her Banbury constituency. You can follow Victoria’s campaign here. 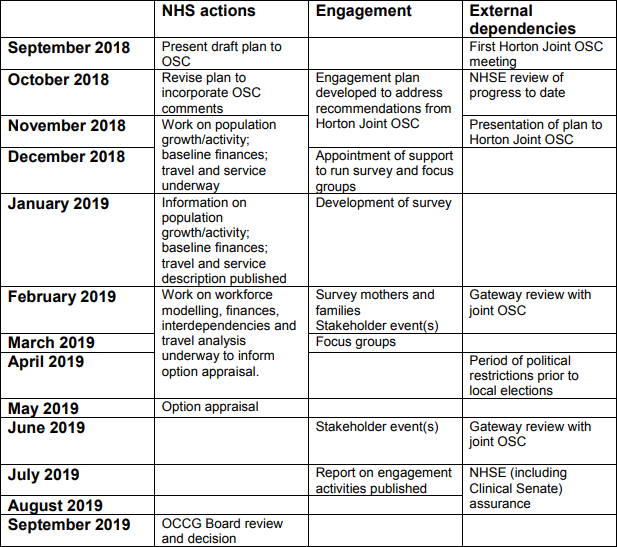 By way of background, changes to obstetrics at the Horton have been proposed for a long time, and a two-phase consultation was brought forward by the Oxfordshire Clinical Commissioning Group (CCG) to present the proposed options. Just before the consultation was due to launch, the obstetrics unit was downgraded temporarily to a Midwife Led Unit (MLU) due to a shortage of available obstetricians at the site after the Horton lost its training accreditation. The temporary downgrading, and the subsequent decision through phase 1 of the CCG’s consultation to permanently close obstetrics, was challenged by local authorities, both through the courts and a referral to the Secretary of State for Health & Social Care. Following the outcome of the referral to the Secretary of State and the subsequent advice from the Independent Reconfiguration Panel (IRP) in March 2018, I have continued to follow the issue of obstetrics at the Horton on behalf of concerned residents. A useful summary of events is provided by Paul Parsons of the Consultation Institute. For the CCG and Overview and Scrutiny Committee to work together to involve stakeholders from the wider area to participate in the debate. You can read the IRP’s full advice online. As a result of what the Secretary of State requested, a new Horton Joint Overview and Scrutiny Committee was established to ensure that the views and voices of everyone who used the Horton, not just those in Oxfordshire, were taken into account when considering new proposals. This Horton Joint OSC has met several times already, and has published various papers on the approach it is taking, including options under consideration for the future of obstetrics provision. You can read these documents, and other updates, on the CCG’s website, and you may be interested in the timeline for completion of the work; the CCG Board expects to review the options and make a decision by the end of September 2019. There are a full range of options under consideration including full obstetrician services at the Horton to no obstetrician services, and everything in-between. You can review the full long list here. I know that my constituents would desperately prefer to see the retention of obstetrics services in one form or another at the Horton, and that is what I am supporting. I do not believe that the permanent closure of obstetrics at the Horton would be in the interests of local South Northants women and their families, and I am pleased to be supported in this by a number of colleagues who represent constituents who also use the Horton, in particular Victoria. I have written to Cllr Arash Fatemian, Chairman of the Horton Joint OSC, to make this clear, and I will be engaging in the upcoming stakeholder events to put the point across directly. I would encourage as many South Northants residents as possible to contact Cllr Fatemian as well to ensure that he is aware of your feelings on this. We are also ably supported at a Northamptonshire level by Cllr Fiona Baker who is leading on the Joint OSC as our area representative, and she will be ensuring that all Northants women who have given birth recently receive a letter asking about their experiences, as part of the wider consultation process. Fiona is doing a fantastic job, and I know she would be pleased to hear from you directly. Additionally, the campaign group Keep the Horton General has won the right to appeal against the decision made in the High Court by Mr Justice Mostyn in December 2017 into the legality of the consultation process on the downgrade of the Horton General Hospital. Their case will be heard in the Appeals Court in mid-March. Finally, I know that the issue of parking at the John Radcliffe is of concern to many people. Cllr Rosie Herring, one of the governors of the Oxford University Hospitals NHS Foundation Trust, has asked me to raise the matter with Oxford City Council and Oxfordshire County Council to try and find a solution, as the local planning policy is to reduce parking provision where possible, not expand it. I am grateful to Rosie for bringing this to my attention. Should anyone have any specific concerns or questions about the Horton or the John Radcliffe, please do get in touch with me directly via email. I will provide further updates as and when I can.